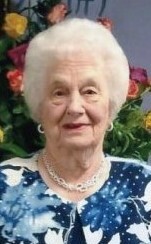 Thelma Jean Allen Moore of Benson, age 85, entered into her eternal rest on February 5, 2019 at UNC Rex Heart and Vascular Hospital. Jean was a lifelong resident of Johnston County. Please join the family to celebrate her earthly life and her heavenly life, which she is now celebrating. The family will receive visitors Friday, February 8, 2019 from 5:00pm – 8:00pm at Rose and Graham Funeral Home in Benson, NC. The funeral service will be Saturday, February 9, 2019 at 11:00am at Johnson’s Chapel Pentecostal Free Will Baptist Church, 5386 Johnson’s Chapel Road, Benson, NC. Burial will follow the service in the church cemetery. After the burial, all friends and families are invited to a time of fellowship and lunch at the Elevation United Methodist Church Fellowship Hall at 5101 Elevation Road, Benson, NC. Visitors are also welcome to drop by the Hardee-Moore Homeplace, Jean’s home at 3125 Elevation Road in Benson, NC, this week until the visitation. She was born July 21, 1933 to the late Donnie Clayborn and Ila Barefoot Allen. In 1952, Jean married the love of her life, Lemuel Oliver Moore, and began a life of joy and happiness in a marriage for over 50 years. Oliver entered his eternal rest in 2002. Jean then reconnected with life-long friends, enjoying her last years being active with the Benson Widowed Persons Association, enjoying much fellowship while dining out with them at least once per week. Jean was always a country farm girl at heart. Growing up in the Elevation community, Jean moved down the road and into her new home when marrying Oliver. She and Oliver lived on and operated the family farm for decades, growing cotton, tobacco, corn, and soybeans. Vegetable gardens were at the core of her being. Even though she was a hard-working family lady, Jean always had a love of young children. For 20 years, she dedicated that love to students, families, and staff as a teacher assistant at Four Oaks Elementary School. Jean had a passion for cooking and will be fondly remembered by her family and friends as being a consummate southern cook. The number of meals she prepared, and wonderful celebrations shared around her kitchen table, are too numerous to count. Her famous raisin cake, apple jacks, chicken salad, biscuits, fresh vegetables, and homemade pickles were a piece of heaven on earth. Jean’s Christian faith was first in her life. She was baptized at an early age at Burnell Baptist Church in Four Oaks, NC. After marrying Oliver, Jean was an active member of Johnson’s Chapel Pentecostal Free Will Baptist Church for more than 67 years. In this Christian life, Jean and Oliver raised three children who adored her. Hayden Moore (Deborah Moore) of Raleigh, NC, Sylvia Mobley of Garner, NC, and Steve Moore (Stephen Kane) of Durham, NC, brought her joy every day. She often commented that her family was her greatest blessing. Her grandchildren, Kimberly Williams (Kendall Williams) of Raleigh, NC, Spencer Mobley of Garner, NC, and Michelle Moore of Jacksonville, FL, adored Mama Jean. In 2017, her beloved great-granddaughter, Gracelyn Williams, joined the family, bringing Mama Jean much joy during her last years. Jean was preceded in death by Phil Mobley, Sylvia’s husband, a son-in-law who adored Mama Jean. Jean is also survived by her sister, Marie Tart of Willow Springs, NC, and brother, Wade Allen of Cedar Point, NC. Other survivors include many nieces and nephews whom she loved greatly. Her brother, D.C., preceded her in death, along with many other lifelong friends. Because Jean loved them, flowers are welcomed. Children’s books may also be donated in Jean’s memory to the Four Oaks Elementary School Library with checks made payable to Four Oaks Elementary School PTA, indicating “For memorial books,” and mailed to 180 W. Hatcher Street, Four Oaks, NC 27524. Arrangements by Rose & Graham Funeral Home in Benson, NC.